Smoothies are such a fabulous snack. The most perfect way to get your 2 serves of fruit in per day, as well as fibre, vitamins and minerals. In Australia, Dragonfruit are in season, lucky us! They are an asian fruit, although it is great to see they are now being grown locally. A couple of weeks ago I was lucky enough to visit a dragonfruit farm on the mid-north coast of NSW. There are two varieties available, white flesh and a red flesh, the red dragonfruit being much sweeter and our personal favourite. Dragonfruit is packed full of fibre to keep our digestive system healthy, help lower cholesterol and prevent bowel cancer. It also contains the immune boosting antioxidant Vitamin C as well as Vitamin A, also an anti oxidant essential for good eyesight and glowing skin. To prepare the fruit, simply cut in half and scoop out the soft flesh with a spoon. For this smoothie, you will see I have also added chia seeds which are packed full of fibre, omega 3 oils, protein, and iron. Milk is high in calcium for healthy bones and teeth, protein for growth and repair as well as micronutrients such as magnesium, vitamin A, zinc and B vitamins. If you are dairy intolerant, simply replace with your choice of rice/almond/soy milk. Thanks for stopping by my blog! 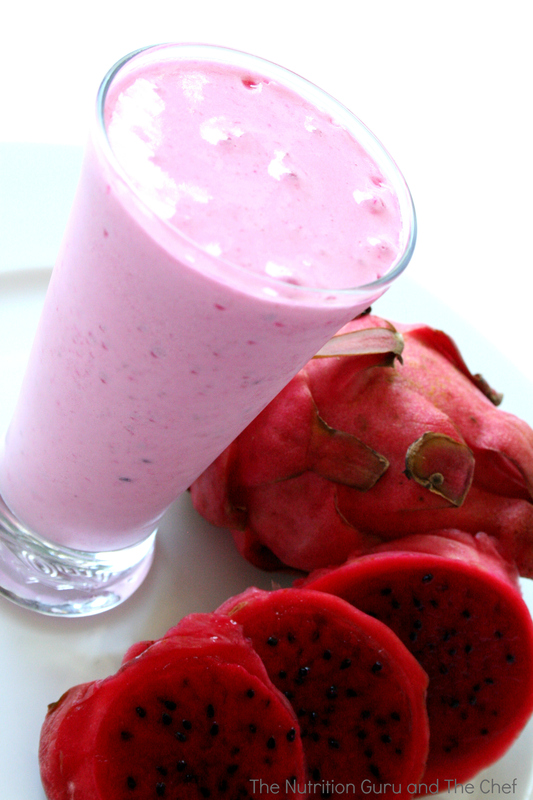 This smoothie looks so yum, dragonfruit is something I’ve never tried working with, but I’m inspired! The colours are amazing, and dragonfruit is such a superfood! They are just beautiful! and packed f ull of antioxidants as well! i always wanted to have my own bog kinda like this one its really neat, do you think you could hit me up with en email with some advice, thanks.